It’s there that she meets Dante Berlin, a handsome and elusive boy to whom she feels inexplicably drawn. As they grow closer, unexplainable things begin to happen, but Renée can’t stop herself from falling in love. It’s only when she discovers a dark tragedy in Gottfried’s past that she begins to wonder if the Academy is everything it seems.Little does she know, Dante is the one hiding a dangerous secret, one that has him fearing for her life. I'm going to start by saying this. If you loved Twilight you'll love this book. If you don't like Twilight it's probably not the book for you. I for one really really enjoyed this book. I loved the setting, the writing style and the main character. I read the whole thing in two sittings as found the plotline really engaging and found it really easy to rocket through. 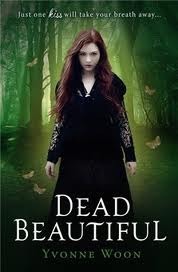 The main criticism I can forsee being made about this book is that it is similiar to Twilight. I'd have to agree and same there certainly are parallels. The main character moves across the county and starts a new school. She is drawn to a mysterious and brooding handsome stranger who has a paranormal edge to him. While I think it'll really bother some readers I really didn't mind and thought the story itself had enough going for it that made it sufficiently different from Twilight. I thought the main character in this book was really sweet and lovely and enjoyed getting to know her. The main love interest of the piece is dark and brooding and just a little bit gorgeous. I also enjoyed the host of characters you meet, such as the other students in the school, Renee's Grandfather and several of the teaching staff and can;t wait to find out more about them. I also loved the setting. A gothic and mysterious boarding school with an antiquated curriculum and code of conduct was just a little bit too awesome for me! For me the best bit about this book is the potential it has as a story overall. Loads of ideas have been set up in place ready to be explored in the future. It ends on an excruiating cliffhanger and leaves so many answers which I need answered asap. All in all a welcome addition to the paranormal romance genre. Great reveiw. The scene in science class just screamed Twilight to me! Thanks for the review! I really want to read this but I don't usually like books where the romance is based on 2 people meeting and being almost instantly in love... I'm going to give it a try though- it might surprise me! I have this book on its way to me and I'm looking forward to it. Something about that green cover speaks to me. Have heard the comparisons to Twilight but am ignoring them for now.